I was asked to share a story from my time at a camp in Ukraine, but I struggle with story writing. So instead, let me share some of the beautiful things I witnessed. I saw a young and sweet boy, whose mother left him, share his darts with a girl and teach her how to throw them just right. I saw a group of girls help clean the dishes after a meal with smiles and laughter. I saw forty-two children live together, laugh, play, and make new friends. I heard the laughter of many amused kids as I did my best to talk and play with them in my broken Russian and Ukrainian. I saw the many sweet notes that they sent each other every day through the camp mail box. I heard the sorrow and grief of a young boy as he shared his thoughts about the war between Russia and Ukraine through a poem he wrote. I saw a boy catch and release a lost bird that had flown into the building during lesson time. I heard the overwhelming sound of the children thanking the kitchen women after each meal. I heard a joyful noise as all of us raised our voices to God in praise through song. I held a girl asleep in my lap as we traveled home over bumpy roads in a hot bus full of kids. I opened my hands for an acorn that a child gave me as he left the bus. Camp has so many more memories that I will never be able to put into words. I love the children and the staff and I will always remember this week! I love the song “Blessings” by Laura Story. Several new connections (or thoughts) jumped out at me when I was re-listening to it recently. Israel and the Middle East is the first thing that comes to mind. So many lives lost on both sides. So much hatred. Because of my multi-cultural friend circle, I get to hear about it from both perspectives. The hatred is what really hit me. Recently, a family friend and history buff visited and gave us a thirty minute condensed summary of the history of this war. Mind you, this is only the tip of the iceberg regarding this issue. I need to do more research on the topic, but for now I’ll recap what the best history teacher I know said. (Don’t quote me, I did not take notes (unfortunately) —this is simply what stood out to me). Prior to WWII, many Jewish people started to feel the tension growing in Europe. So many of them began searching for somewhere to live and call their own. The Jews did not have a country of their own at that point. They were a spread out people group. What they did have, however, was money—in the form of family silver, heirlooms, etc. But they did not want riches. They wanted land to call their home. Several Jews came into modern day Israel (called Palestine back then). They offered to pay the Palestinians two or three times the amount their land was worth. Thinking the Jews were stupid to give so much money for the land, they happily agreed. Gradually, the population in Palestine became more Jewish. At this point Britain said, “No more Jews are welcome to Palestine.” (Britain was in charge of that area at that point). With nowhere else to go, the Jews continued in. Then the problems started. The Palestinians, who had fairly and enthusiastically sold their land, realized something. “We have no home now.” The other countries surrounding them did not take kindly to their Arab brothers’ plight. So they decided to go back to Palestine and buy back the land from the Jews. After the Jews refused to sell their land, the Palestinians decided to take matters into their own hands—or rather, their own weapons. And that, my friends, is the five minute story of why Israel and her surrounding Middle Eastern countries hate each other (save Egypt—because they traded peace for the Sinai Peninsula) and fight over the land. Both sides have killed, and neither is innocent. But, I found this little glimpse of history to be quite enlightening on the whole topic. I think about persecuted Christians around the globe. Compared to what they face every single day, we really have nothing to complain about here in the US. Yes, we have a huge national debt, businesses are being forced to provide birth control & abortion pills to their workers, and free speech is limited in many cases (unless you agree with what’s politically correct), but… we can still worship freely together with other believers on Sunday (or any other day of the week) without fearing imprisonment, fines, or beatings. We can own a Bible and not even think twice about it, when our brothers and sisters in North Korea face execution if a Bible is found in their possession. We have so much to be thankful for, and no matter what you think of the recent political choices, we have the most religious freedoms anywhere in the world (though they are under heavy fire). Join me in praying for Christians all around the world to hold fast to the word of God and to never lose sight of the reason we run run this race. God knows what we need, and He always hears us. Even if we don’t get an immediate answer—He hears. This reminds me of B.J. Higgins. When this vibrant young teen, on fire for God, contracted an infection on the mission field, he used his six week opportunity to unite Christians and witness to everyone he came in contact with. His parents knew God was near, but through this ordeal they learned to trust Him entirely—having to give God their only son. B.J. died from the infection, but God took the seemingly hopeless and terrible situation to bring many souls nearer to Himself. I like to play games—especially computer games. What I have found (and sometimes forget and have to re-learn), is that no matter how good you get and no matter how long you play, it does not satisfy. Ever. I always want something more—the games may give a fake brief sense of satisfaction and accomplishment, but it does not last. And then I am left looking for something better. Or rather, someone better. Things of this world will never fully satisfy. Only a personal relationship with our creator can fill that void. I hope you were able to take something from my insights, or just enjoy hearing the song again (or for the first time). What thoughts strike you when you hear these lyrics? Last week some of my sisters decided to try an experiment that I remember doing when I was younger. 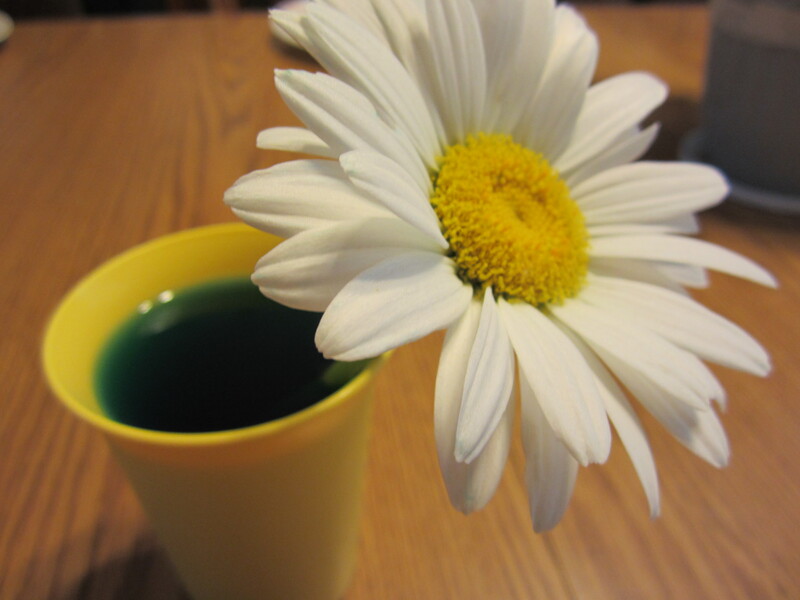 You cut a flower and put it in a vase (or cup) filled with colored water (food coloring). After several hours the flower should have streaks of color (blue–in this case) on its petals. I took these pictures two days into the experiment. Now–almost a week into the project the flower is still almost completely white. (My sisters informed me that it does in fact have a bit of blue, it is just so light and hidden that you have to search for it) I named it the ‘Defiant Daisy’. And then it *hit me. I am often just like that daisy. I don’t mean to say that I’m a flower. So then, how am I like the daisy? As a follower of Jesus, I should act like Him more and more each day. Everyone I interact with should see Jesus in my words and actions. But, in order to do this I must surrender every area of my life to God and I must read His words (Scripture) each day. 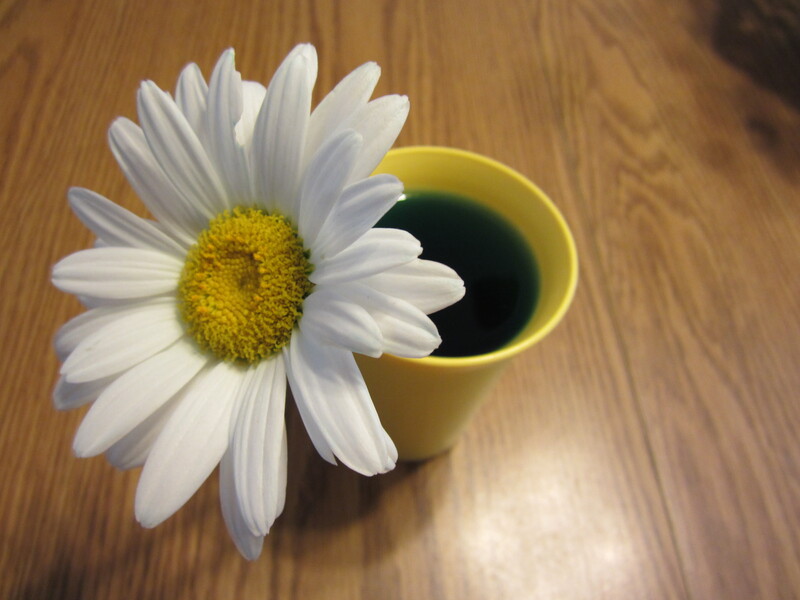 If I keep even a little part of my life for myself — if I say, “No, God, I know what is best for me,” I become like the ‘Defiant Daisy’. Although I may think I have everything under control, I’m actually refusing the life giving “water” that I need to continue growing in my walk with the Lord. Just as our flower needs water to continue to flourish (and yes, I know–it also needs sun and dirt and that this example is not perfect–but please bear with me a little longer), I need to have daily communication with God. Whenever I leave God out of any area of my life, I hinder my spiritual growth in all areas. He is always faithful in showing me what I need to surrender (or in some cases, re-surrender) to Him. Recently (the last few months) He has used my church, friends, Teenpact, and many other things to convict me of how I use (or spend) my time. During our adult Sunday School this past spring, we went through the Christian **Disciplines. For some reason, I never saw “Being a Manager/Steward” as a discipline, but it is. I always think of being a good steward as having to do with money and physical blessings. I never realized it included the short time we have on this earth. Maybe this is an obvious thing to you all, but it had not been to me. I’ve always struggled with an addiction to computer games. And I am very good at coming up with excuses on why playing them is ok and/or good. :p I don’t know if gaming is a definite ‘good’ or ‘bad’ thing, but I do know that to spend endless hours on something is never a good thing. We should have variety in our life. Gaming takes that (and many, many other things) away from us. In March, I quit the game I was addicted to. That was a very hard decision to make and an even harder action to carry out (especially since I had to leave in stages and not all at once). Then I became addicted to blogging. Just kidding! 😀 No, then we went to a lecture in the park (by the same people who did the money lecture mentioned here) on addictions. Simply quitting an addiction won’t help you. You’ll just go on to get addicted by another one, because you didn’t get to the “root” of the matter. The reason we become addicted to games, drugs, alcohol, smoking, etc. is because we think we will find satisfaction in them. The addiction comes because the particular thing does not give us lasting fulfillment. We find quick fulfillment, but as soon as we leave we crave more. There is only one person who can give you true and lasting fulfillment/satisfaction. His name is Jesus. Did you know that God created us serve and worship Him? When we do what we were made to do we find true and lasting joy. Every one of us is unique, made in God’s image. I’ve actually found through experience that when I serve the Lord and worship Him I am content, joyful, and just generally a more satisfied person than after I spend time on myself through games, books, etc. My challenge to you is this: Look at the different areas in your life. What can you limit or cut out to make more time for the Lord? Is something in your life becoming an idol? Pray for wisdom as you search your heart. The Holy Spirit will reveal to you the different things you should change. It may be hard at times, and you may not be ready to give whatever it is to God. But, if you think of all God gave up for us… it puts our things into perspective. We serve an awesome and loving God, and I can’t wait to see what His plans for my life are! For now I am called to serve my family, love my friends, and make use of every moment to help prepare and grow me for my future ministries. * “Hit me” is an English cliché meaning “I realized” or “I thought of something”. ** Discipline does not just mean punishment. The original meaning is akin to training for the olympics. It is hard work, but you do it to become stronger and in the end it is worth all the pain you went through.